Very volatile month indeed; as mentioned earlier, the current correction is similar to the one we witnessed in Nov'10 to Dec'11 period. We all know how choppy the markets have been in recent times on intra-day basis; the same was the case in the earlier period as well. Now, it is even more pronounced by virtue of the fact that institutional traders are allowed algorithmic trading. Whilst such moves create lot of fluctuations in intra-day basis, on EOD/EOW/EOM basis, prices do rationalize. Regardless of which one comes true, one point is very clear; index linked ETFs, and index heavy weights like LT, SBIN, Axis Bank, ICICI Bank, ITC are moving towards accumulation bands. The last leg of correction will perhaps take them down to about 15% from recent lows. The maximum damage will now come from the IT pack which is excessively valued. 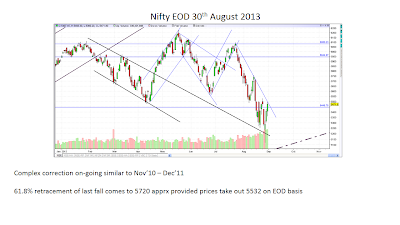 Just a 5% to 10% correction there is enough to generate 20% damage to Nifty. On the investment front, dips should be bought into with a 2-3 year horizon. I have been updating my picks when prices come to accumulation point. As usual, I prefer to keep maximum exposure to the index itself than individual stocks. With a 2-3 year time horizon and target gains of 25% PA, Im willing to take a 10% to 15% hit in my equities portfolio. 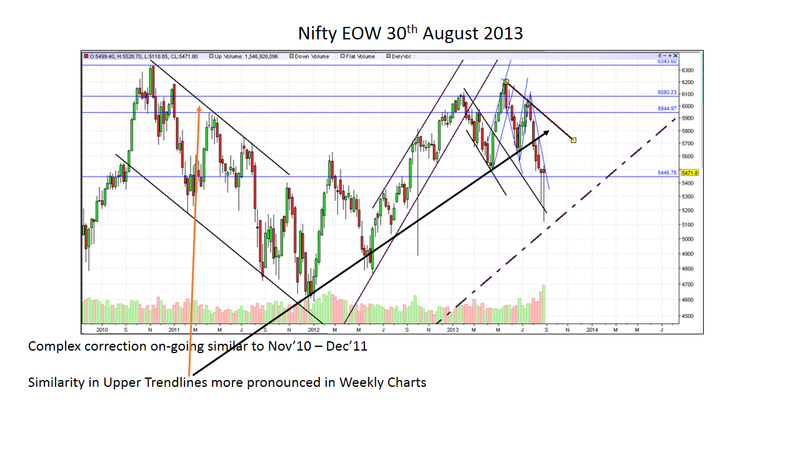 So personally Im Long Equities and Short FnO as on date. For secure bull markets in India, we need Rollar to be at sub-48.25 levels. Whilst the current levels of 66-68 are extremely disturbing, there is empirical evidence to suggest that history is repeating itself. If you pull out the data for the last 25-30 years, pre-election years have seen rupee crashing by as much as 20%-25% and then rationalizing after election results. I think the same will happen yet again. There is a lot of sectoral churning that is taking place which usually is an indication of bear market rallies. 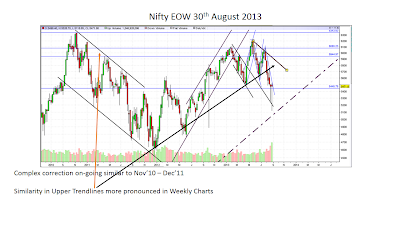 Critical Dates in Sep: 22nd Sep '13 i.e. Fall Equinox The 3 days prior to this date and subsequent to this date will bring large swings and alert traders stand to gain a lot here. This date also coincides with the elections in Germany that will be the real game changer. The majority is looking at US Fed tapering and the war on Syria - my personal view is that when all are looking at the most obvious points and views start converging at those points, they don't turn out to be game changers. The shockers will always come from the most unexpected places. Whatever US Fed does, it does to prop up the USD or specifically demand and circulation of dollars. Whether its QE, whether its war or an internal recession - doesn't matter. With crude prices knocking 110/120 to the barrel, US has achieved what it wanted to achieve. QE will keep going until people dump the dollar - period. Gold and Silver have in all likelihood found bottoms in Rupee terms. In dollar terms too, that may have already happened. Boiling crude is a serious issue and IMHO, one more leg of fall is pending. Not sure whether Dow has topped out but it is approaching some critical points and a 10%-15% correction is not ruled out. As Keynes kept saying, 'Markets are irrational to the extent you are solvent' In real life, it simply means that markets will keep doing their own things and we need to act when our target buying/selling points come through. It is perfectly okay to have a view but when prices confirm otherwise, we have to junk our personal views and follow what the ticker is showing. The worst thing a trader/investor can do is 'look for what suits his/her view'; a sure shot recipe for disaster. Happy Investing and Trading; last week of September should be exciting and Im eagerly looking forward to it. We have a lot of festivities lined up in 2nd half of 2013 and I hope all of you enjoy the same. 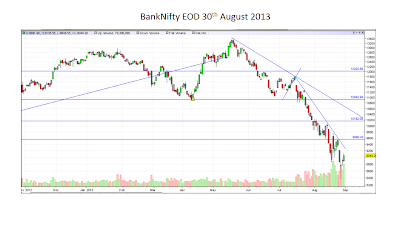 First of all thank you very much for letting us know your market outlook for September 2013. You have mentioned under "Preferred Count" that "above 5720 counts need to be revisited"? I didn't understand the logic behind that statement. 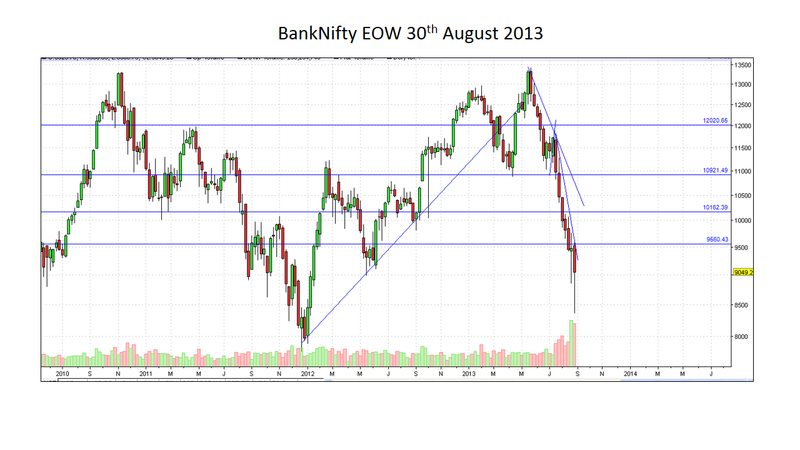 5720 is a 61.8% retracement level from 6093 to 5119. IMO, even if market goes above 5720, your count could still be valid. Actually, if you are comparing current market situation to that of 11-12, then there is every possibility that it can go all the way up to the top of the channel which comes to around 5850-5900 levels, which also coincides with 76.4%-80% level of the fall from 6093-5119. Thanks for flagging this and I agree with you; even with prices on Nifty hitting 5944 within October '13, the preferred count may still hold. 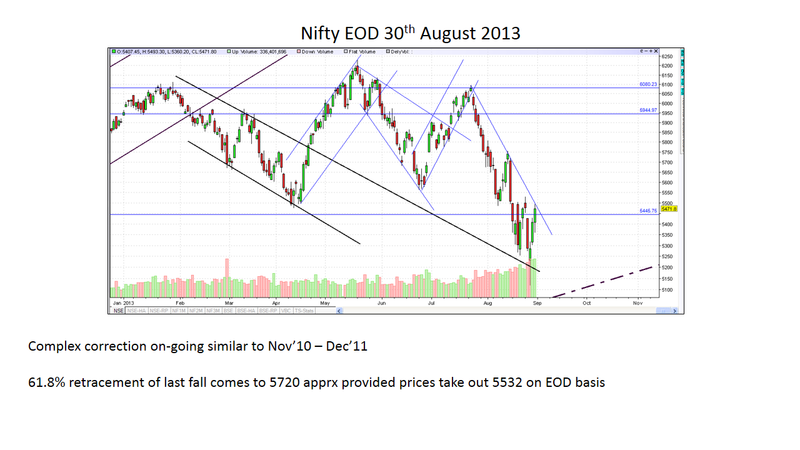 However, I would like to revisit the outlook if EOD> 5720-5740 levels and especially if it is on EOW basis. Only time will tell and I look forward to your inputs once again when we get there.